They may all look the same to the untrained eye, but all snowmobiles aren’t created equal. 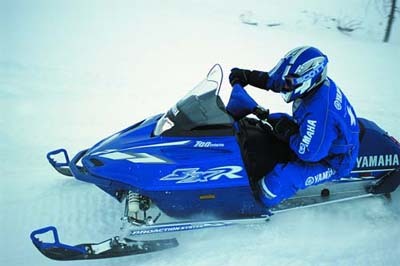 There are high-performance snowmobiles; trail sleds, mountain sleds and touring machines. There are snowmobiles made for two; sleds made for long-range riding and others made for hauling. Before you plunk $7,000 down on the latest, greatest liquid-cooled 800, though, there’s a few questions you ought to ask yourself. Chris Reid, snowmobile product manager for Yamaha, says the answers could save you thousands of dollars - and make the difference between a good time and a great one. "The first thing you have to determine is what kind of riding are you going to do?" Reid asks. Many new buyers convince themselves they need a bigger, faster, more sophisticated machine than they are going to use, he says - and waste a lot of money in the process." "There’s a lot of posers out there, and thank goodness for them, but a lot of people don’t really need the hottest sled on the market to have fun," he explains. Ooo! Just like a beer commercial! Sometimes, less - like Yamaha’s little 500cc Phaser at $6,500 - is more. Reid says an ideal entry-level sled for bombing around the cottage will be in this class, fan-cooled as opposed to liquid-cooled, and twin cylinder vs. a triple cylinder. "If you’re going to be a weekend warrior, this is where you should be starting," he advises, admitting that the 600cc class offers the most bang for your buck but that sleds down to 440ccs are still a lot of fun. Not everyone is a homebody, however - and Reid says those who plan on a putting a lot of miles between themselves and the cottage ought to consider something with a little more get-up-and-go under the hood. Something liquid cooled and in the 700cc range is the minimum if it’s long-range trail riding two-up that you plan, Reid recommends, advising new buyers to splurge for the "deluxe" package available on most models that usually includes options like a reverse gear and electric start. "Would you buy a car without reverse or a big motorcycle without electric start? I don’t think so," Reid points put. "The same is true when you’re talking about a 700cc touring sled." At the upper end of the snowmobile spectrum are the high-performance sleds which can cost upwards of $11,000. Reid says machines like Yamaha’s SRX offer cutting-edge technology and are "about as quick as they get" - but like sports cars, have limitations when it comes to riding trails or touring. "That’s not to say you shouldn’t buy one if that’s what you want," Reid says, "but few beginners actually need an SRX to enjoy snowmobiling." Want a sled but can’t justify the expense for a new one? Good, used snowmobiles can be found starting at $2,000, if you’re willing to shop around and take your time buying. Ideally, you’ll find your dream machine at a dealership somewhere - but sometimes, the perfect sled will be found through a private sale. Examine the track. It’s a diary of what the snowmobile has been through, where it was ridden and how it was cared for. What’s more, a replacement is going to cost you in the neighborhood of $1,000. A good track suggests a mature, responsible owner who cared for his or her machine and rode on good trails. Tracks that are worn, cracked, damaged or torn suggest abuse and/or hard miles over poorly maintained trails. Study the overall appearance of the machine. Is there pride of ownership? Or is the hood cracked, the skis dented and the seat ripped? Machines that look like new will likely run like new, too: People who take the time to clean their sleds likely took the time to keep them in good repair. Look at the owner. Is he or she the kind of person you’d lend your car to? If not, take a pass on their sled. A snowmobile that’s been abused isn’t the ideal machine for your first sled. If you don’t know snowmobiles, take someone who does - or better yet, ask if you can take the sled to a dealer for an inspection. A $20 investment now could save you hundreds later.